The Circle (Sammy Hagar, Michael Anthony, Jason Bonham, & Vic Johnson) w/ Many other special guests. Great to have Vinnie Paul come out and drum on Poundcake!! Sammy your voice is PURE!!! I got shut out in the lottery, but it was 80 degrees in the Twin Cities today so I grilled up Sammy's Asada recipe, got myself a cocktail and partied with you all in spirit! Have fun down there Redheads! Happy Birthday Sammy! At the Cabo Wabo Cantina now. Anyone got an extra ticket. Brought my son for his first b day bash. Looking for a ticket for the 9th, 11th or 13th Show. Willing to pay a lot. I have to have a ticket to the show. Hi Ivy, I'm Russ and will also be in Cabo starting this Saturday for the whole week of Sammy's shows. Have you had any luck scoring a ticket to any of his shows? I too entered for all shows, got none, and only 2-3 people in our group of 12 got tickets to the Oct. 11th show. Any information or suggestions would be appreciated, take care and safe travels. 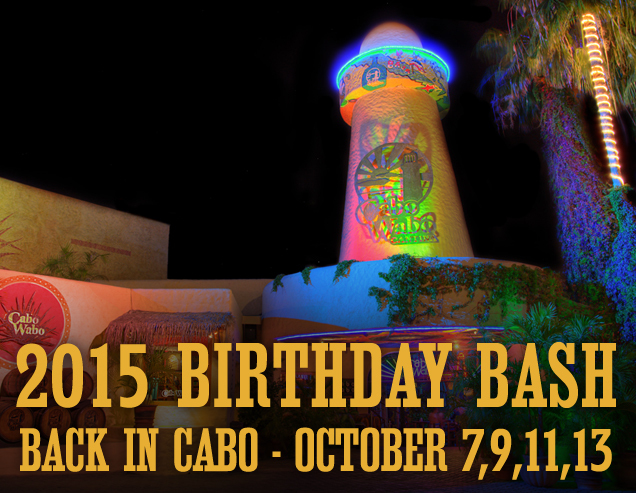 I am looking for a single ticket to the Oct. 11th concert at Cabo Wabo in Mexico. I'm going with a group of family/friends that have been going to see Sammy for years and unfortunately many of us did not score tickets during the initial drawing or the 2nd chance. If anyone has a single ticket for the 10/11 show, or advice how I can score a ticket, please let me know. looking for 2 tickets - wife & myself - any possibilities send message! The wristband distribution starts at 2 and runs till 10. There usually is a line beginning at noon(ish). It is a way to meet other RedHeads coming for the show. The doors to get in open around 7 to 7:30 and people will be lined up for this by 6. The show starts around 9:30(ish) and usually are 1hr 30min to 2hr. The Cantina is yes small I have heard 500 and it does get packed if your up toward the front. Sue from Chicago. Same for me. My first time here and I am short. Do we get our wrist band at noon and then come back at 6:00. A friend of mine has been in the Cantina, not for the concert, just visiting. She says it is really small. I just want to take decent pictures, be able to get a drink and go to the washrooms (LOL). I figure if it is small, we will be able to see Sammy. I had my friend compare it to one of our local bars. I know other redrockers have said during the concert it is hot and crowded. I don't think I want to risk my digital camera. Staying at the Marriott Fairfield. Does anyone know what type of cameras we are allowed to bring into the shows. I have a Canon Rebel T6s. Please advise. From my experience most people including myself get there early to get wristband(s). This means that later on when your ready to go to the club for the show your all set to do so. You also can get to know others there for the show waiting in line. I have heard a number of 600 for how many get in. Sorry, another dumb question....do you recommend getting there at Noon for the 2PM wristband line? Or should we just come later on in the afternoon and go directly to the line to get into the show? Trying to figure out the best way to utilize our time (and feet for standing).... Also, how many get tickets for each show? Wondering how big the crowd will be. Thanks as always! Counting down the days! If it works like previous years you will actually need to do an overnight sleeping on the sidewalk. Has anyone in the past purchased the "dinner" tickets for the birthday bash. How early in the morning am I going to have to get there to get these tickets? Ok, that is what I wanted to know! Thanks again! Your Welcome for the information. As for when you get in the only area that I know of that is off limits is the upper balcony. Thanks so much! This is very helpful. Once inside, are we able to go wherever we want to get the best view (I'm super short - Just want to be able to have a view)? Thanks again! The ticket/wristband pick up starts at 2 each show day. There usually is a line to get them around noon. It is a nice time to RedHead bond. The time it takes depends on how together everyone is. If nobody tries to beat the system and have proper ID it goes quick. The doors to get into the show do not open until 7 show starts 9:30ish. There are people who will get their wristbands and then wait from then to get in. It really depends on whether you want to endure that wait. Hey Redheads! I'm a newbie to this exciting event! Anyone have any tips or can explain how this has worked in the past? Meaning, will it take forever to get thru the ticket line? After getting the tickets, do you just turn around and get in line for the show? Wondering when you are allowed inside....and how for us shorties to get the best view...where to go? Thanks all! I noticed you posted on all dates about getting tickets. Just to let you know you can not do a buy of someones ticket. The WINNER HAS TO CLAIM ONE TICKET. You could be a guest of someone who got two but is alone. I see your there the whole week so an option is dinner/show combo tickets. They go on sale the 6th and 10th at noon but are VERY LIMITED and usually a line starts the day before. Entered for all 4 nights, got none. Will still be in Caba the entire week of shows. Any suggestions? Anyone need to sell their tix? Let me know. We are very bummed but will still be there and hopefully hear the shows! There is no such thing as VIP or Meet and Greet for these shows. If you hang outside the club after the show there have been instances where band members hang with fans. We are going to this show. October 11th. Can we buy a VIP or meet and greet? Unless your a big drinker it is not worth the AI. If your also looking for a place near the clubs and Marina I only know of one that is AI which is the Sandos Finnisterra. The AI ones a lot of RedHeads stay at are the RIU resorts. You might also as a non AI look at the Tesoro. It is in the heart of the Marina and walkable to all the major clubs including of course Cabo Wabo. I've never been to Cabo. Won Ticks for night 3. Any recommendations on where to stay? Prefer all inclusive (I think). Well my wife and I didn't get our tix for Sammy's B-Day in Cabo. But we are still going to Cabo!!! What we have done in the past is just hang out outside Cabo Wabo and watch the show form the big screen. And about 4 songs before the show ends, they let us ALL in!!! It's pretty cool. You just have to be hanging outside the night of the show!!! WE WILL BE THERRE!!!! When do they draw the names for the second chance drawing. Yes the code is linked to that show date. Second chance lottery question: Is the initial losing code linked to that date only or if drawn can I choose the date? If anyone has extra tickets for any of the last 3 shows I will pay good money for them. This is my only chance to see Sammy in Cabo. I had to beg my husband for years to finally get this trip so this is a once in a lifetime opportunity for me. Someone please help a fellow redhead out!! SSOOOOOO Excited!! We were drawn for Nights 1 & 4!! We LOVE Sammy & Cabo!! Flights & Condo booked!! Wondering if they are done letting you know if you got tix? Does anyone know if they notify everyone all on the same day? Got tickets for the 11th, booked flights and rooms. Ready to party, first trip down in 4 years. See you in Cabo.